The Challenge: Add something childlike (not necessarily childish) to your workspace or home. A few months ago I read the book, Fish, which inspired me to make my space more playful. I spent a Sunday afternoon while Jason was watching football adding fun pictures, quotes, and toys to my workspace. Because I feel pretty good about the childlike feel of my office, I wanted to add something more intangible. Having Adultitis often leaves me with frustrating side effects. Maybe you experience them as well – worry, doubt, pessimism, fatigue. Even though I want to have that childlike joy and hope which shines from every childhood picture of myself, it doesn’t always come naturally. It would be hard to put childlike joy and hope on my shelf but I can try to consciously do things that help me to live with passion and to have a better perspective on things. So, I made a ‘joyful hope’ container, in which I will put little notes of things that give me hope and bring me joy, as a grown-up. On those days in which I need to be reminded of these childlike Adultitis-free qualities, I will take out one of the small folded up pieces of paper and hopefully be inspired to change my attitude and actions. The first thing that I wrote down was the hope I felt seeing the sun shine today, after two weeks of clouds. Creatively, this may have been the trickiest one yet. My office space — and most of our home, for that matter — looks like it was decorated by Geoffrey the Giraffe of Toys R Us fame. My office is always a highlight for kids, a veritable smorgasboard that includes Spiderman action figures, a cardboard cutout of Boba Fett (wearing a jester hat and lobster beads), Play-Doh containers, a few beanie babies, a Slinky, an alligator head from Florida, a lava lamp, and an abundance of other toys too numerous to count. Needless to say, adding another item of childhood whimsy to this hodgepodge would be like tossing a fistful of sand into the Mojave Desert. So I was forced to think outside the box, which led me inside a box. The ice box, as my grandma would say; the refrigerator, in 21st century terms. 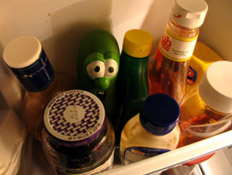 So I took my Larry the Cucumber squeeze toy and squeezed him between the lemon juice and French dressing. He seems to like it there. Who knew opening the refrigerator could be so much fun? Dandelions. Look for flowers where everyone else would see only weeds. At first I thought this would be a tough one. Anyone that knows me knows that I am a child at heart and I have alot of Snoopy stuff, die cast cars, trains of all types and Kim and Jason stuff at home and on my desk at work. So I decided to go at this one from a different angle. I went in the old toy box in the basement and I picked out about 12 small toys. Then I went down to my lumberyard after hours and placed these toys at each of my co-workers desk. Pete my boss always wanted to learn to fly so he got a pilot. Bill raises mules so he got a tiny mule. Ray is called tech-no-man so he got a little robot. Joe deer hunts so he got a very very tiny deer. etc. To try to throw them off I put something on my desk. I can’t wait until Monday morning when my co-workers discover their new desk partner! Today I put a bouncy ball in my car as well as pictures of 4 camels (in honor of Kim’s celebration of the 1st Hump Day last Wed) in my car (my traveling office on wheels. Today Doug and I made our kitchen table a little more fun. Instead of the traditional flowers as a table’s centerpiece, we choose Darth Vader. He was a great dinner guest and we are looking forward to breakfast already! For this challenge, I created an “Escape Adulthood” playlist on my iPod….with all kinds of fun child-like themed songs…songs from my favorite Disney movies, Veggie Tales, and other fun songs like Go Fish’s ‘Ladybug’ song….I can enjoy this little bit of childhood at home, at work or anywhere in between! This one was a little tough for me because I am currently away from my work and home. So I had to improvise a bit. I decided to change the text greeting on my phone from the boring “welcome” to “Dream Big! Laugh! Play! Be Alive!” Every time I turn on my phone I will be reminded of some childlike traits! Update on challenge #4: Placing little toys on my co-workers desk was a huge success! There was a buzz around the office as each person found his or her little treasure. What a way to start a Monday morning! All fingers pointed to me but I came back with the point that I also got a surprise, so there! As I was placing the surprises on the employee’s desks Sat. night, I decided to place our newest employee’s surprise in her desk. Everyone was very excited as one by one each person came out with the surprise. And with every happy announcement it made new girl Patty sadder and sadder. She was really disappointed that everyone got something except her. Her co-workers looked around and on her desk but nothing. Then someone suggested she should look in her desk and there it was. She screamed in excitement and here was this toy of a little girl in a car with a clear dome in the back with a tiny rabbit running around in a circle thru a tunnel. I think she felt she got the best surprise of all. As they try to figure this mystery out one called the other the toy bandit. I plan on telling Pete because with his pilot I hope to encourage him to take flying lessons. I put a kaleidoscope in my office, next to my computer. With the spinning chair, it’s quite a trip! Yesterday’s challenge surprised me. My church work involves a full day at the local Juvenile Detention Center. We have worship services and 12 Step Programs with the children there. I sort of forgot to skip until I was inside the door and headed down the long corridor to the control room. I was entering with a couple of gentlemen who serve with me. They rolled their eyes as I skipped down the hall. At the other end though, was another fellow traveler who is more like minded than the others. When I caught up with him, he didn’t doubt a thing, just joined in a skipped along with me. I happily skipped through most of the balance of the day. I’ll be skipping more too, it was fun! My den/study/office was much like Jason describes until a backed up sewer totalled our basement last summer. Now all of those toys and curiosities are boxed up and in storage. It will be months yet before I have it all put back together. Being one who always saves the best for last, that will be the final room of the project. My longing for my Lincoln Logs, puzzles, juggling balls, wooden machines, souvenirs, and doo dads, is what keeps me going through the grind of sheetrocking and moving walls about. Of course my workshop is full of adult toys like saws and routers and stuff, but that’s not the same. So, thanks to your encouragement, I’m going to make myself a new set of Eskimo Yoyos and set them here by the computer to comfort and encourage me, to resurrect that joyful space. My grandkids took me to see Mr. Magorium’s Wonder Emporium for that same express purpose. They think my room was the inspriation for Mr. Magorium’s shop and I think they want it restored almost as much as I do. I’m starting to think that it is going to be very difficult feeling grumpy when there is a Barbie doll on my desk. I was slightly hard-pressed to find a place in my home that didn’t already have childlike things, but I found one! My vanity mirror! I placed toys on top and they make me very happy:) Once I get a new job in July, I plan to make that workspace as childlike as possible, too. I’ll probably be starting the challenges over again anyway, and this challenge may just come at the perfect time!